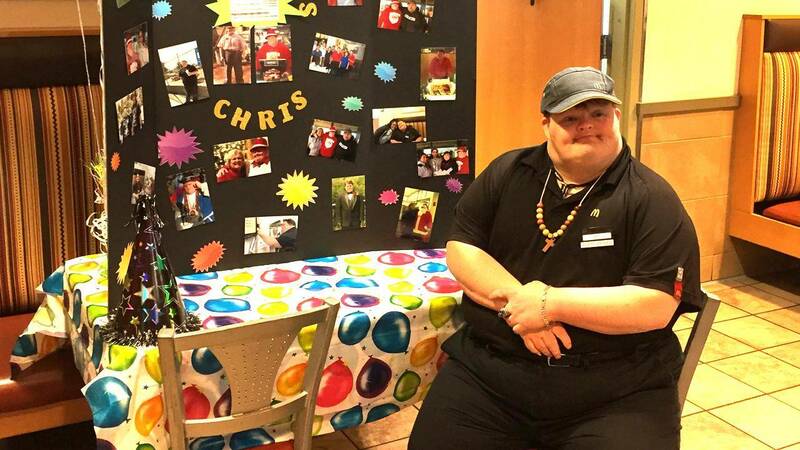 A McDonald’s employee with Down syndrome is being celebrated for his dedication to the company after working there for nearly 30 years. Chris Campbell, 43, has been an employee at the Georgia location on Buford Highway for 27 years. His job tasks are ever-changing — from maintenance to greeting to making Happy Meal boxes, Campbell does it all. Kellie Vander, the owner of the location where Campbell works, said she thought it was important to celebrate his achievement. Vander said Campbell is a star employee. He’s never late and loves what he does. The customers love him too, she said. So Vander threw him a party on March 15 and awarded him with a “Golden Star” trophy. The McDonald's location also donated a portion of the sales during the party to the Down Syndrome Association of Atlanta. Campbell's story gives hopes to parents of children with Down syndrome, Vander added.